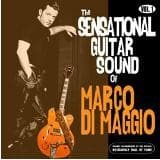 Marco Di Maggio has been recognized by the international press as one of top worlds RnR guitarist. His brilliant musical background covers many styles, ranging from Rockabilly, Power Surf, RnR, Neo Swing, Country and Blues. With this double album, he shows his dexterity, versatility and maturity in music, where his extraordinaire technique and music taste are now at top worlds level. 20 tracks, 5 of them with vocal parts and the rest completely instrumental, where Marco plays all the instruments: Guitars, Double Bass, Bass, Guitarron, Drums, Vocals, just assisted on a couple of tracks by the Sax player Chris Pacini and Vibraphonist Franky Palermo... Several original numbers penned by Marco and some guitar standards as Tiger Rag, San Antonio Rose and Lover...Rockabilly, Western Swing, Fingerpicking, Surf, Country, Jazz and more...a various album where Marcos Gretsch is the main theme, one hour of pure, genuine Rockin & Swingin highlight. TRACKLISTING: 01. San Antonio Rose (b. Wills) - Inst. 02. Egno (m. Di Maggio) - Inst. 03. Lover (rodgers - Hart) - Inst. 04. Polka Dots & Moonbeams (burke - Van Heusen) - Inst. 05. Tiger Rag (n. La Rocca) - Inst. 06. I Love You Because (l. Payne) - Inst. 07. Pink Thunderbird (peek - Davis) 08. Lulas Memories (m. Di Maggio) - Inst. 09. Ta Dah (m. Di Maggio) - Inst. 10. Tonite Will Be The Last Nite (scott) DISC #2: 01. Cherokee (r. Noble) - Inst. 02. Surfandango (di Maggio - Chisci) - Inst. 03. All By Myself (d. Bartholomew) 04. Silver Moon (m. Di Maggio) - Inst. 05. Tokyo Affair (m. Di Maggio) - Inst. 06. Mr. Sandman (p. Ballard) - Inst. 07. Superpicking Polka (m. Di Maggio) - Inst. 08. Forever (di Maggio - Moreno) 09. Bruno (marco & Massimo Di Maggio) - Inst. 10. Rnr Blues (langhorn, Gordon) - Inst.